Armand Guillaumin (1841-1927), Epinay-sur-Orge (c 1884), oil on canvas, 58.4 x 71.1 cm, Private collection. Wikimedia Commons. The most famous of the ‘vanished’ Impressionists, his richly chromatic paintings are in museums and galleries around the world, but seldom get much attention now. However, his influence on the work of Camille Pissarro, Paul Cézanne, Paul Signac, and Vincent van Gogh was considerable. Born in Moulins, he first came to Paris in 1857 to work in a shop, but took evening classes in drawing with the aim of becoming a full-time artist. He attended the Académie Suisse in 1861, where he became friends with Camille Pissarro and Paul Cézanne. To support his painting, he then worked for the Paris municipal services, at times digging ditches for three nights each week, and painting as much as he could in the daytime. He remained deeply poor until late in life. In 1868, he left his service work, and painted blinds, as Renoir and Pissarro did at various times in their careers, but returned to municipal work in 1872. In that year, he painted near Pontoise, in company with Pissarro, Cézanne, and Béliard. Although some were against his taking part in the First Impressionist Exhibition of 1874, he showed three landscape paintings in it. In addition to painting, he also made engravings, although his prints are even harder to find than his paintings. Continuing to live in Paris, he again painted in company with Cézanne when they lived near to one another in 1875 and 1877. In 1875, following the winding up of the original company of Impressionists, he joined l’Union, organised by Meyer with Pissarro as its leading light, but never exhibited with that group. Instead he participated in five more of the Impressionist Exhibitions, in 1877 (the third), 1880 (fifth), 1881 (sixth), 1882 (seventh), and 1886 (eighth and last). 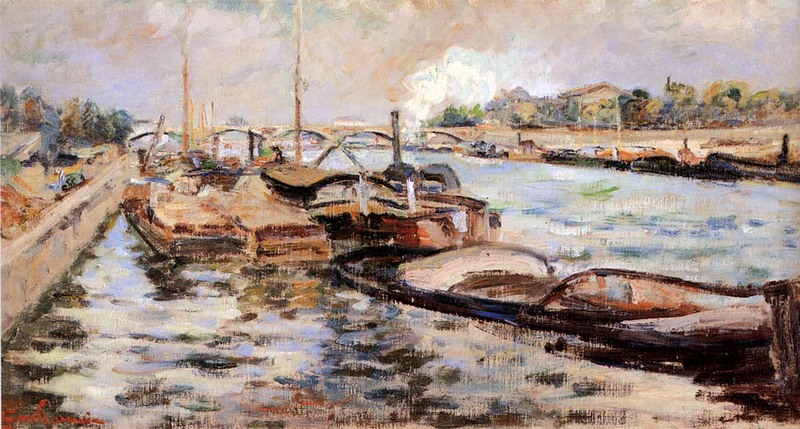 Signac befriended him in 1884, and for a while Guillaumin mentored Signac as he was starting to paint en plein air. As a result, Guillaumin joined Signac’s group, and exhibited with them in December 1884, with Seurat, Odilon Redon, and Schuffenecker. 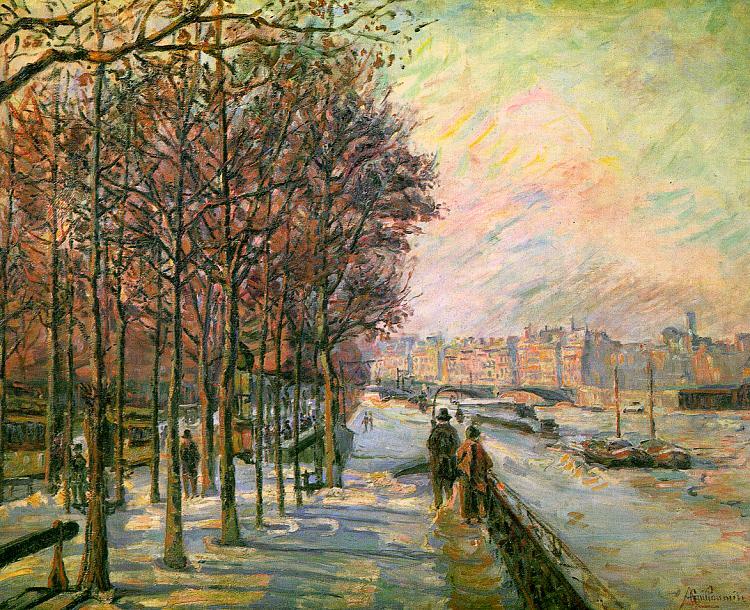 During 1886-7, when Vincent van Gogh was living in Paris, he too became friends with Guillaumin, and visited him frequently. 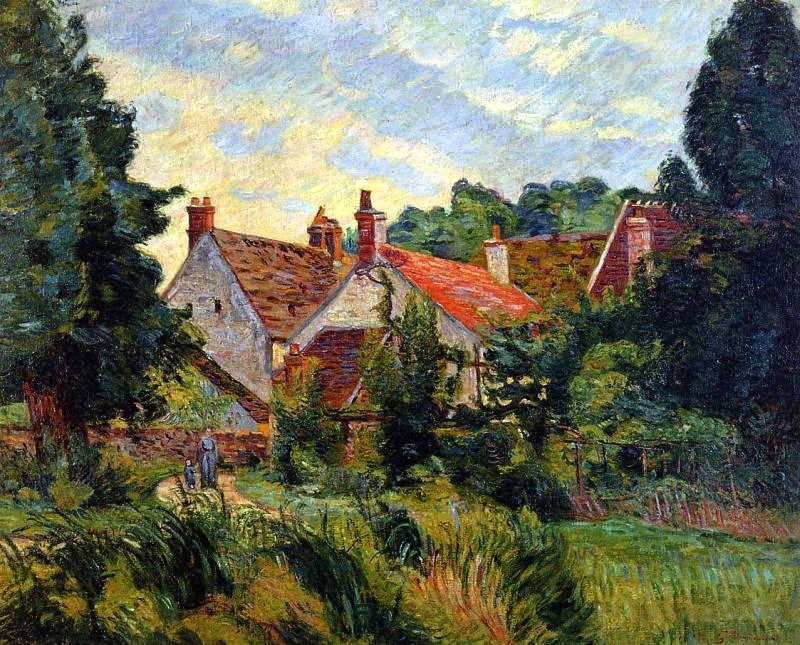 At the time Guillaumin was living in the former studio of Daubigny. Having endured his entire life in poverty, working whilst trying to find time to paint, in 1891 he won sufficient in a lottery to finally provide him with financial security. However, by this time he had lost contact with his Impressionist friends, and it is usually considered that his paintings had become weak, and had lost their earlier attraction. His output increased considerably, though, and most of his surviving works are from that late period. Armand Guillaumin (1841-1927), The Seine (1867), oil on canvas, dimensions and location not known. Wikimedia Commons. 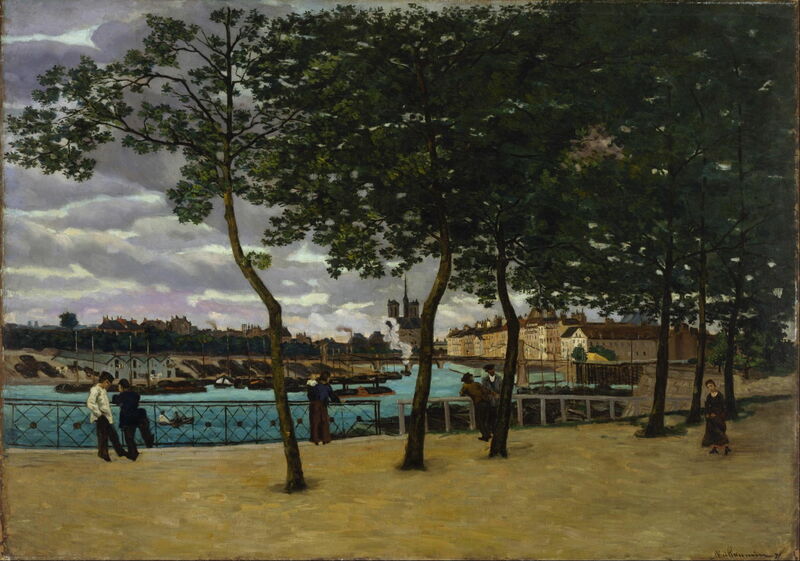 The Seine (1867) is a typical early motif, a view of the River Seine in Paris, and shows unusually early coarse facture and bright colours, considering that it was painted two years before Monet’s celebrated views of La Grenouillère. 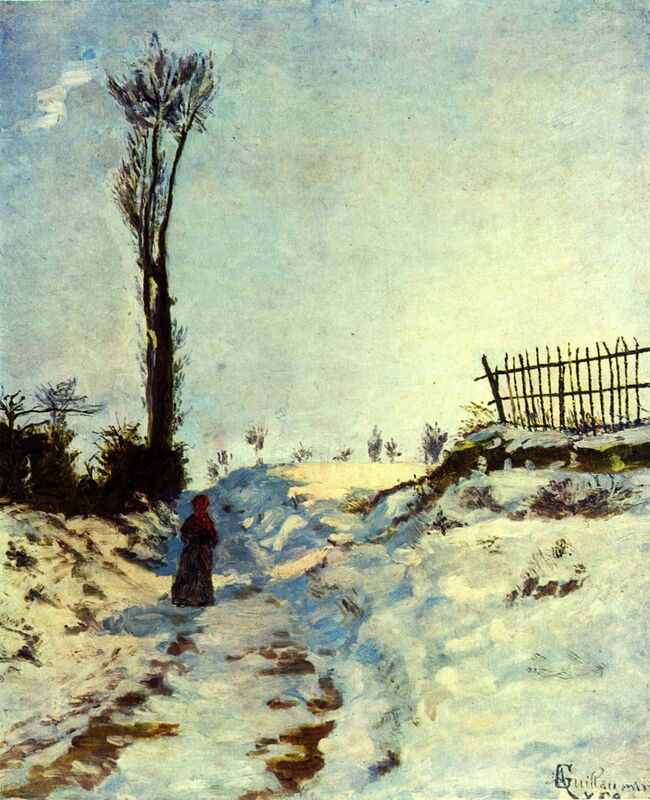 Armand Guillaumin (1841-1927), Hollow in the snow (1869), oil on canvas, 66 x 55 cm, Musée d’Orsay, Paris. Wikimedia Commons. At the time that Pissarro, Monet, and Renoir were starting to explore the stark forms and subtle colours of snow scenes, Guillaumin painted Hollow in the snow (1869). Armand Guillaumin (1841-1927), Landscape (c 1870), oil on canvas, dimensions not known, Private collection. Wikimedia Commons. 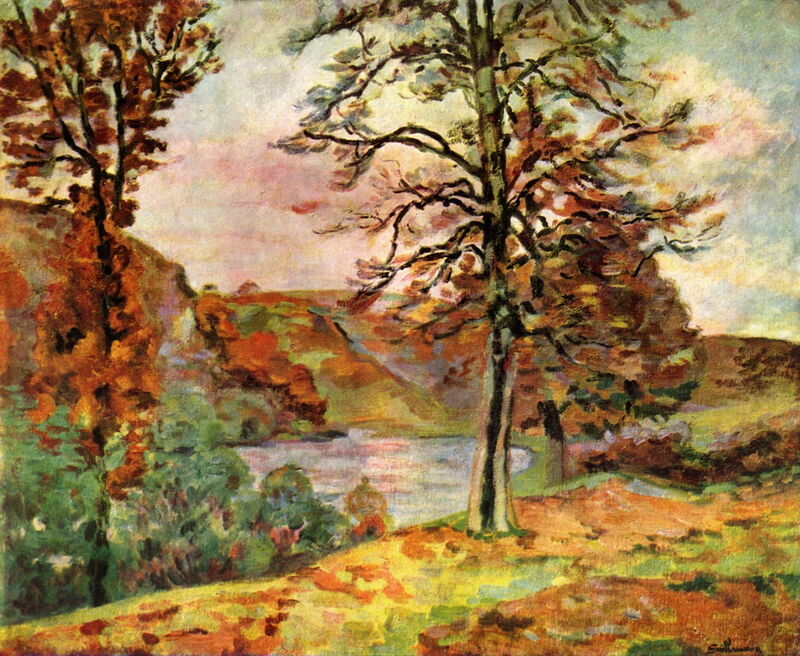 Guillaumin was distinctive from early on in using very high chroma colours in his paintings, as shown here in his Landscape (c 1870). Armand Guillaumin (1841-1927), View of the Seine, Paris (1871), oil on canvas, 181.3 x 126.4 cm, Museum of Fine Arts, Houston, TX. Wikimedia Commons. This View of the Seine, Paris (1871) has clearly been worked on over a longer period in the studio, and appears unusually well finished and detailed. 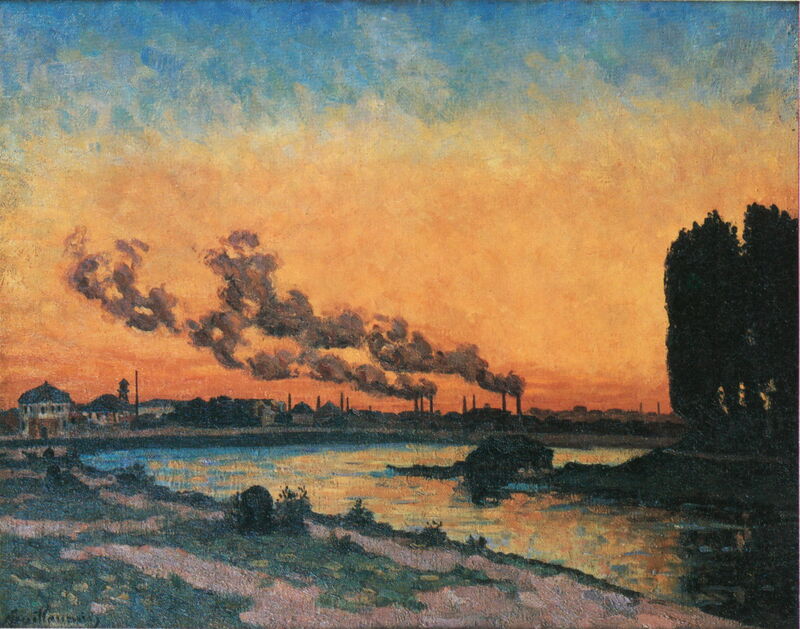 Armand Guillaumin (1841-1927), Sunset at Ivry (1873), oil on canvas, 65 x 81 cm, Musée d’Orsay, Paris. Wikimedia Commons. Probably his most famous painting today, Sunset at Ivry (1873) was bought by Dr Gachet, a great friend and patron to the Impressionists who cared for Vincent van Gogh during the final months of his life. It was loaned by Gachet to the First Impressionist Exhibition in 1874, and is now in the Musée d’Orsay. It must rank among the greatest of Impressionist paintings of sunset. Armand Guillaumin (1841-1927), The Seine at Charenton (formerly Daybreak) (1874), oil on canvas, 53.3 x 63.5 cm, Norton Simon Art Foundation, Pasadena, CA. Wikimedia Commons. 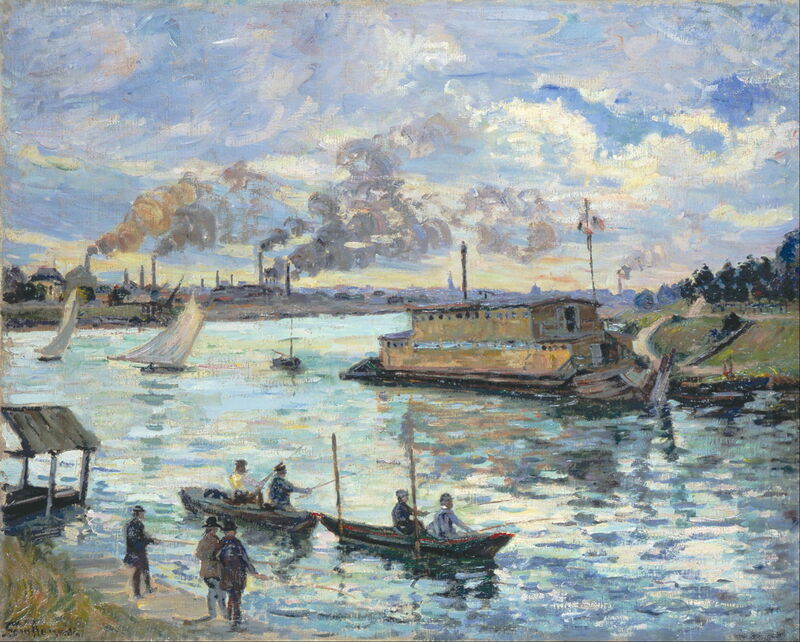 The Seine at Charenton (formerly Daybreak) (1874) is another of his urban riverside views. 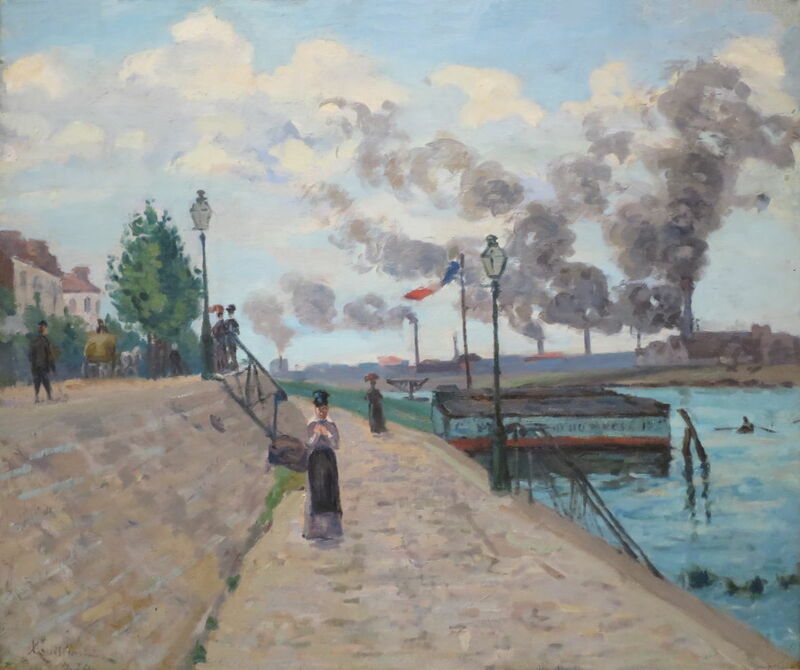 Armand Guillaumin (1841-1927), Pont Marie, Quai Sully (1878), oil on canvas, dimensions and location not known. Wikimedia Commons. 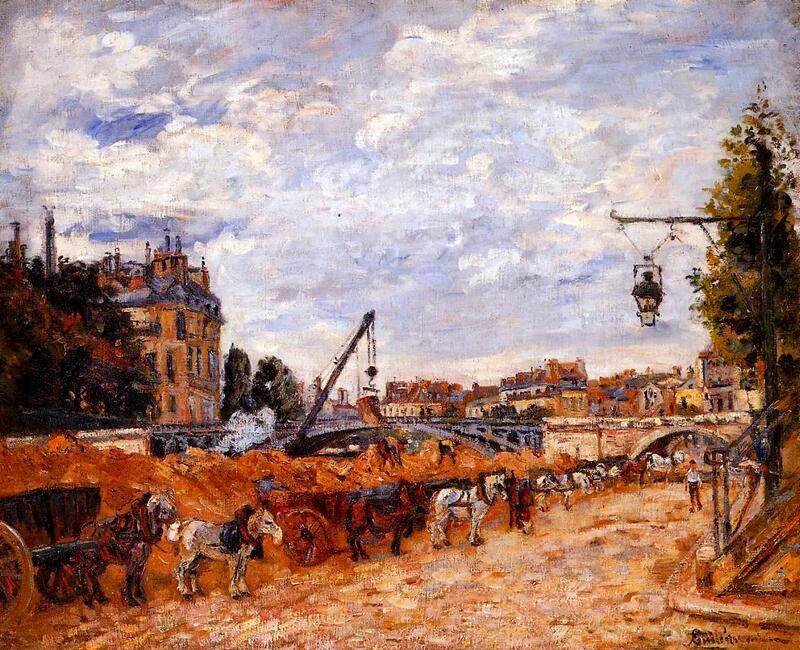 Pont Marie, Quai Sully (1878) returns to his very high chroma style, showing a row of horses and carts queued to move earth during embankment works in Paris. 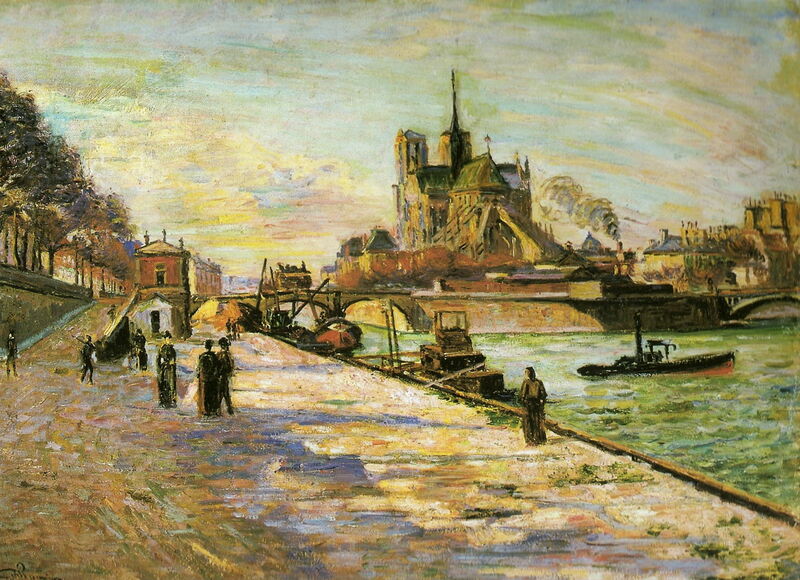 Armand Guillaumin (1841-1927), Notre Dame de Paris (date not known), oil on canvas, 59.5 × 82 cm, Museu Nacional de Belas Artes, Rio de Janeiro, Brazil. Wikimedia Commons. Notre Dame de Paris (date not known) was probably painted during this mature period, and shows a very familiar view. Armand Guillaumin (1841-1927), La place Valhubert (date not known), oil on canvas, 64.5 x 81 cm, Musée d’Orsay, Paris. By Sparkit, via Wikimedia Commons. La place Valhubert (date not known) is one of his finest riverside views. This location is further upstream from Notre Dame, by the Gare d’Austerlitz, and is seen in the warm light of dusk in winter. For me, the best of Guillaumin’s paintings is his Épinay-sur-Orge (c 1884), showing the rich colours of this village to the south of Paris (now swallowed up into the city’s sprawling suburbs). He painted several views around this area, most of which are comparable in their quality. Armand Guillaumin (1841-1927), River Scene (1890), oil on canvas, 65.5 x 81.7 cm, Israel Museum, Jerusalem. Wikimedia Commons. River Scene (1890) is another view of the bustling life alongside the River Seine in Paris, this time with a party of anglers, and two yachts under sail. Armand Guillaumin (1841-1927), Plateau Bromont at Pontgibaud (Puy de Dôme) (1890), oil on canvas, dimensions and location not known. WikiArt. 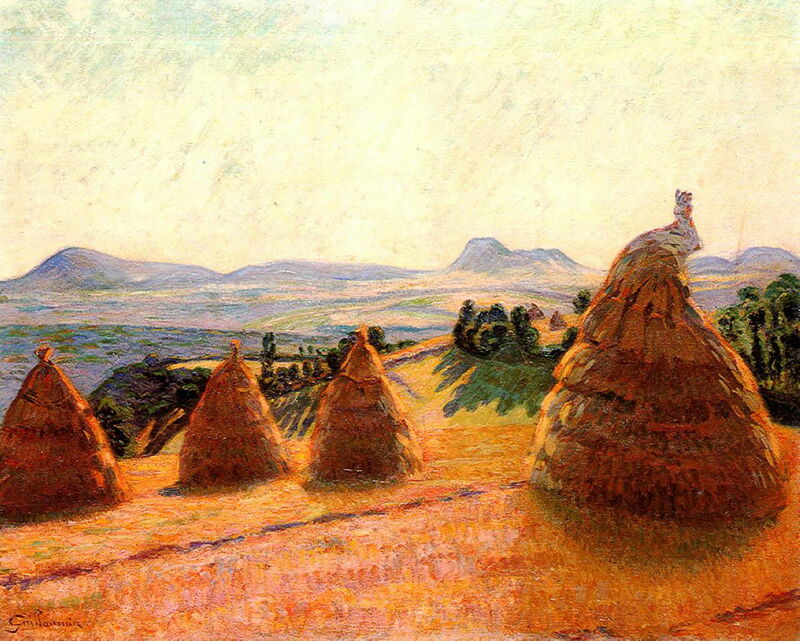 Guillaumin later brought his vibrant colours to the distant countryside dominated by the ancient volcano of Puy de Dôme, in the Massif Central, south central France. 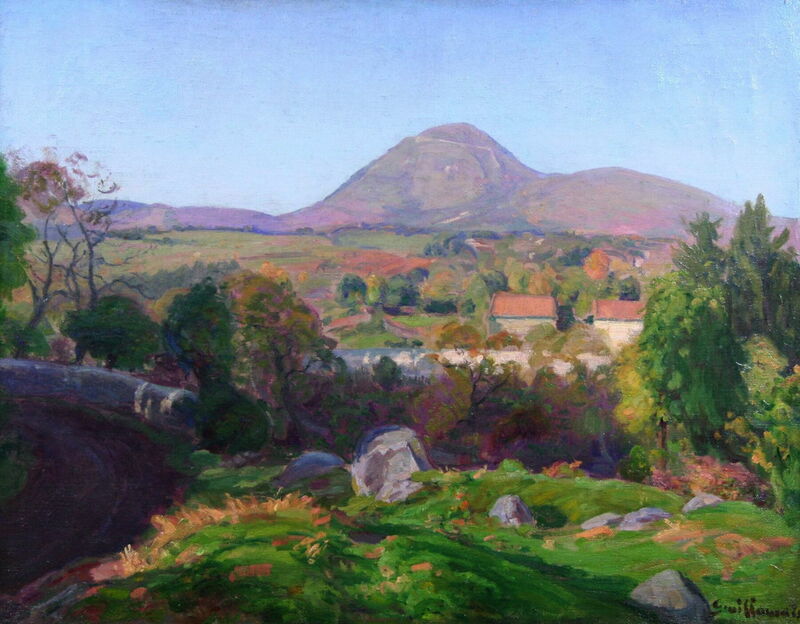 Plateau Bromont at Pontgibaud (Puy de Dôme) (1890) is one of the best of his paintings from that area. Armand Guillaumin (1841-1927), Puy de Dôme Landscape (date not known), oil on canvas, 43 x 55 cm, Private Collection. WikiArt. Puy de Dôme Landscape (date not known) is probably from the same period, but very different in its treatment of the local countryside. 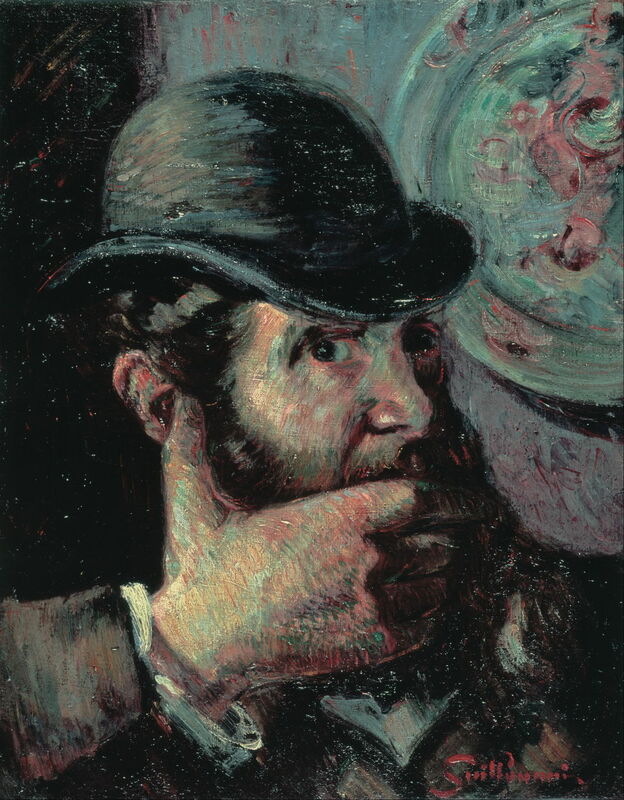 Armand Guillaumin (1841-1927), Self Portrait (c 1890-5), oil on canvas, 40.6 x 32.4 cm, Ohara Museum of Art, Kurashiki, Japan. Wikimedia Commons. Painted around the time that he finally achieved financial security, his Self Portrait (c 1890-5) is almost as colourful as his landscapes. Armand Guillaumin (1841-1927), Snow Landscape at Crozant (c 1895), oil on canvas, 60 x 73 cm, Musée Malraux (MuMa), Le Havre. Wikimedia Commons. 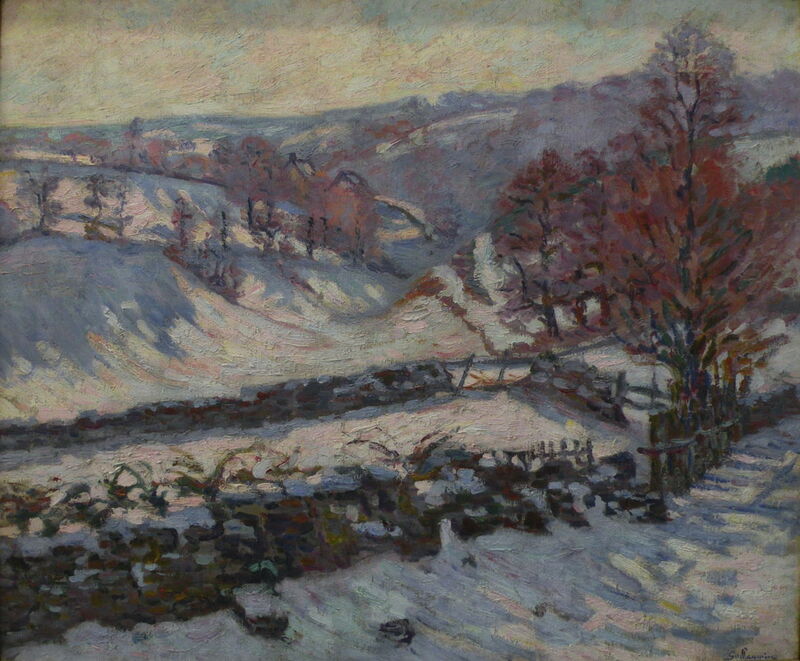 Although many of his later paintings are weaker, some, including this Snow Landscape at Crozant (c 1895), are still well-composed and accomplished. It suggests a reticence, even uncertainty, which could have been a cause of his lack of recognition. 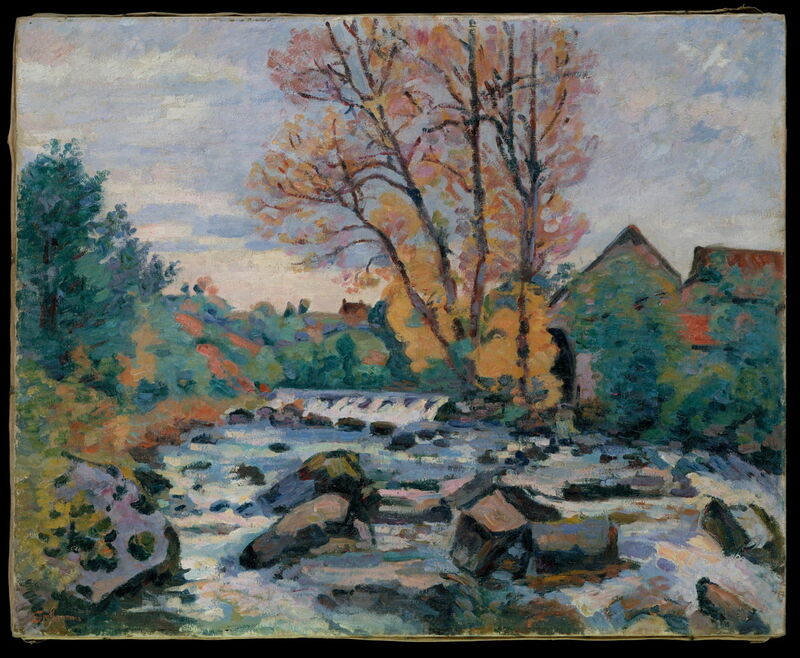 Armand Guillaumin (1841-1927), Bouchardon Mill, Crozant (c 1898), oil on canvas, 65.1 x 81 cm, Photo courtesy of The Metropolitan Museum of Art, Robert Lehman Collection, 1975, at http://www.metmuseum.org. He also explored new motifs, and his style continued to evolve, as shown in his Bouchardon Mill, Crozant (c 1898), which appears decidedly Post-Impressionist. Sadly such paintings were not ‘discovered’ by the likes of Roger Fry, nor were they promoted by dealers or galleries. There can be no doubt that Guillaumin was a fully-fledged French Impressionist who painted as a full member of its inner circle. His most recent catalogue raisonné, by Serret and Fabiani (1971), is almost unobtainable even on the secondhand market, and lists 847 of his paintings. A second volume is apparently in preparation. There is no substantial account of his work currently in print or, as far as I can discover, available electronically. Critical opinion of his work appears to be based mainly on his weaknesses rather than his strengths, and does not do justice either to his importance in the Impressionist movement, or to his best paintings. His innovation, importance, and many great paintings should be celebrated in the company of Pissarro, Monet, and Sisley – not buried by current Monet-centred branding. Posted in General, Painting and tagged Cézanne, exhibition, Guillaumin, Impressionism, landscape, painting, Pissarro, Signac, unknown, van Gogh, vanished. Bookmark the permalink. Some months ago I left a comment on your blog. I’m pretty sure that what I said is that your articles are extremely good. And I say the same today. Bravo. Thank you – that is most kind, again.